The EndoPulse™ (EP) / Canal Finder System™ (CFS) is the SAFEST automated endo handpiece in the market today! By replicatingnatural hand movement using Vertical Reciprocation and a passive ¼ turn, the EP eliminates "Torque Stress" experienced withrotary handpieces and files. File Separation is a thing of the past! Put your HAND FILES AWAY. Accompanied by our Stainless Steel Master Files™ (designed for vertical reciprocation) the EP delivers safe and fast canaldebridement, from Access to Apex, in the most calcified and curved canals with no transportation. Ovoids, fins, and tapers areNO PROBLEM for the EP . Eliminate your expensive Nickel Titanium rotary file needs! No need to buy separate irrigation equipment, it's built into the EP! 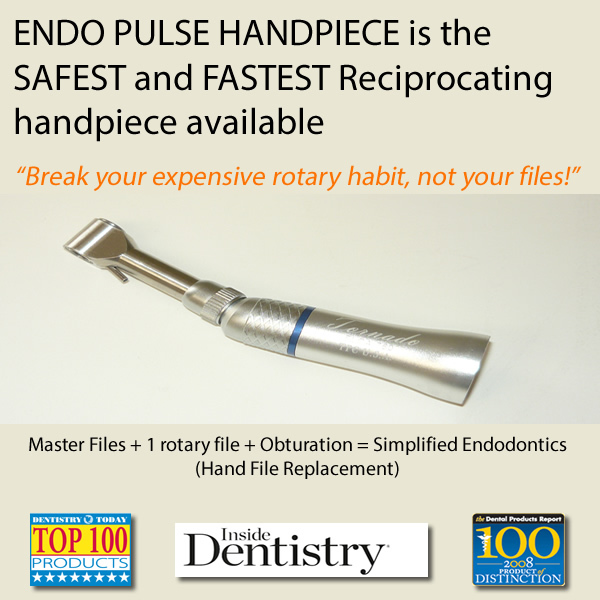 The Endo Pulse™ Self Irrigates as you file the canal!. Use the water from your tubing or add our unique Set Flow System1 todeliver 1% concentration of Sodium Hypochlorite during instrumentation. The EP will agitate syringe administered NaOCl in canalsto reduce endo chair time. Fluid agitation has been shown to improve canal disinfection and smear layer removal. If hand irrigation is preferred, simply turn off water flow and continue to file with the EP. EP is the "Retreatment Machine"
Use Endo Pulse for fast and easy removal of Gutta-Percha and Resilon. Be sure to use it on Thermafil cores! Just choose a #15 or#20 Master file, place it into the GP mass and start the motor. Work down and around GP and watch it FLY out of the canal. Use the irrigation to wash out residue GP debris. Too Easy!